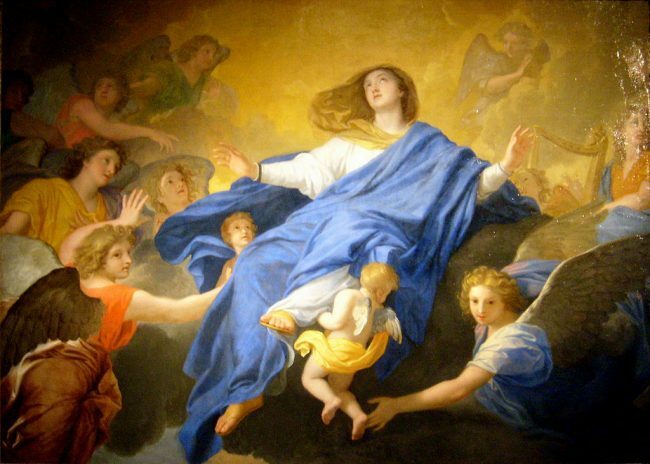 Blessed Feast of the Assumption of the Blessed Virgin Mary! With great joy the Church celebrates this feast day of our Blessed Mother, the day on which we commemorate her bodily resurrection and glorification of the Lord at the end of her life. According to the catechism, Mary was “exalted by the Lord as Queen over all things,” and so we honor her as Queen of the universe and Queen of our hearts. Not only is today a Holy Day of Obligation for Catholics, but also it’s the perfect day to venerate our Blessed Mother, offering her the crown of our hearts. They say that, on the Blessed Mother’s feast days, good things happen for her children. That includes you and me. May you – may all of us – be abundantly blessed on this wonderful feast! Blessed Virgin Mary, Catholic Church, Feast Days, Saints. Bookmark.